Many people enjoy a beer with a meal or at a bar during a night out. Beck's, a German beer company, offers a variety of beers from which you can choose, each with its own nutritional value and alcohol content. Understanding how each brew affects your meal plan will help you meet your nutritional goals. Original Beck's beer, a pale lager, is available in cans, bottles and as a draught beer at many restaurants and bars. A 12-oz. serving of this beer contains 143 calories. While it is not advisable to consume an alcoholic beverage as a snack, the quantity of calories it contains does fit into the typical snack calorie range of 100 to 200 calories. 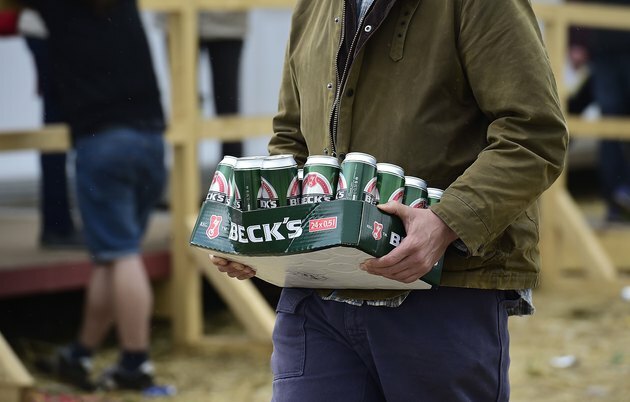 One serving of Beck's beer has 10 g of carbohydrates, a macronutrient that supplies energy to your body. It also contains 5 percent alcohol by volume. You can purchase Beck's Premium Light beer, a diet version of the original pale lager launched in 2005, in bottles and cans. Some establishments may carry it in draught form. This beer is quite pale in color and contains few calories: 64 per 12-oz. serving. If you follow a 2,000 calorie diet, the number of calories in one beer accounts for 3.2 percent of your recommended daily calorie amount. It is also lower in carbohydrates than regular Beck's beer, with 3.9 g of carbs per serving. Additionally, Beck's Premium Light beer is far less alcoholic. One serving contains 2.3 percent alcohol by volume. You can find Beck's Dark beer in cans, bottles and sold as a draught beer. The beer features a dark copper color and contains 146 calories per 12-oz. serving. You take in 11 g of carbohydrates per serving; ideally, your meal plan includes 225 to 325 g of carbs per day, so you need much more than the carbs in one beer to meet your nutritional needs. Beck's Dark beer has 4.8 percent alcohol by volume. The U.S. Centers for Disease Control and Prevention suggests drinking alcohol in moderation. This means limiting yourself to one Beck's beer per day if you are a woman, or two beers if you are a man. Consuming too much alcohol can diminish your reaction time, depress your central nervous system, overwhelm your liver and dilate your blood vessels.